Officially called nonograms and sometimes referred to as hidden pictures, Pic-a-Pix, paint by numbers, Griddlers, and picture logic, this type of puzzle consists of a blank grid with vertical and horizontal clues that signify sequences of black squares in each row and column. When the puzzle is solved using logical reasoning a picture is revealed from the black squares on the grid. I had a lot of fun with the other nonogram apps available on the App Store and I encourage you to try them out as well. My hat is off to the authors for bringing their puzzles to this platform. When I finished a puzzle, though, I was always a little disappointed with the blocky, low resolution result. Whether a blotchy slice of pizza or a pixellated apple, I always felt like I was only coming back for the logic exercise. With these other interpretations of the nonogram puzzle, each puzzle is comprised of one single grid. When the grid is finished, you have your picture. Jumbo GridPix expands the puzzle so that each grid represents only a small piece of the overall picture and you are given the ability to navigate around the puzzle solving areas of your choice. With this system, the resulting pictures are, on average, 70 times larger than the largest puzzle in the other apps. This means that your solution will be significantly more detailed than ever before! Typically with this kind of grid-based puzzle, larger means harder. 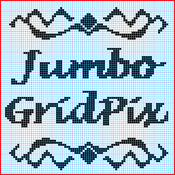 The navigation system in Jumbo GridPix allows you to zoom in or out to a grid size of your choice, whether it be an easy to handle 5x5, a full screen 20x15, or any size in between. It’s easy to use and the difficulty level is literally in your hands. Also, you are not forced to solve every single pixel of the puzzle to finish it. When a puzzle is half finished you can attempt to solve it by picking the puzzle title from a large list of choices. But be warned (and be sure) because a wrong choice will reset the puzzle to a blank canvas! ***** - "I own all of the nonogram apps, and this one really shines"
***** - "A fun, engaging, time-consuming game"
Please contact me at support@sundownapps.com if you have questions or feedback. The free version includes one puzzle, but, fear not, a single puzzle should take an hour or two to solve!